It is the first Monday of the month again, which means it is time for the ArtSmart Roundtable – a monthly event during which a group of art enthusiastic travel bloggers delve into a topic on the crossroads of art and travel. 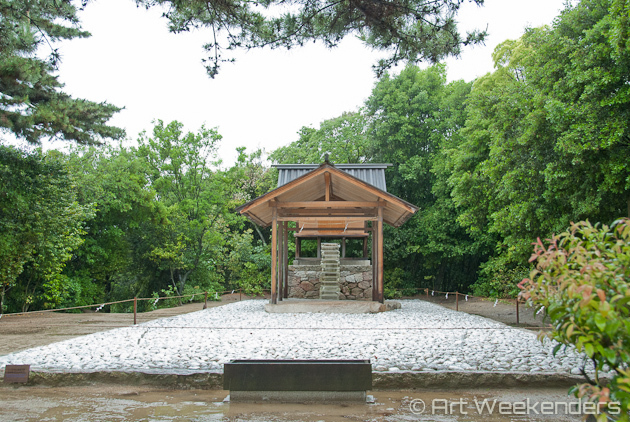 This month the topic is An Art Experience, for which Art Weekenders travels to the other side of the world, to Naoshima, Japan’s Contemporary Art Island, so far one of the best art experiences of my life. Links to the articles by the other ArtSmart members are at the bottom of this article. 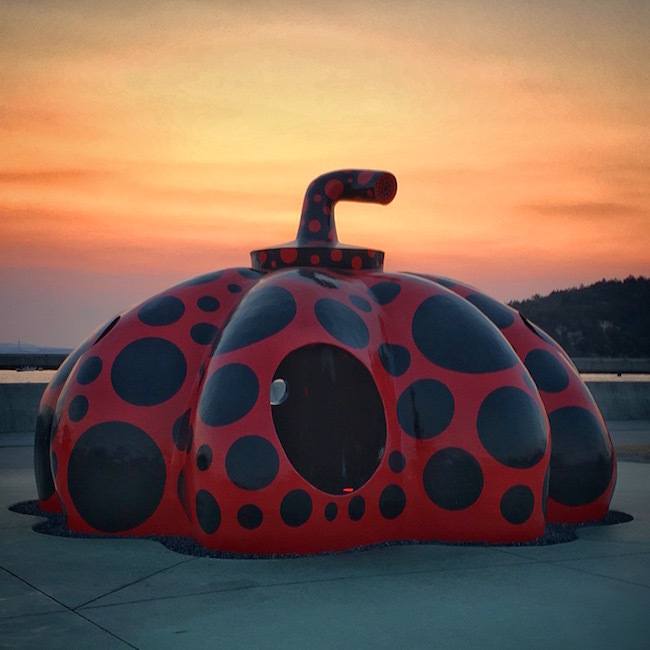 With one of Yayoi Kusama‘s giant pumpkins welcoming you as soon as you arrive in Miyanoura, Naoshima’s mainport, the standard for your art experience at the island is set. Besides works of some of Japan’s best artists you will find quality works of different renown international artists scattered across the island. The perfect place to spend some time for the art enthusiasts among us. It was not until the late eighties that the first steps towards the Naoshima as we know it today were taken. During these years Tetsuhiko Fukatake, the art-lover and founder of the Benesse Corporation, and Chikatsugu Miyake, the mayor of Naoshima, came to an agreement to develop the island into a cultural and educational area. The first initiative, the Naoshima International Camp – designed by the architect Tadao Ando – opened its doors to the public in 1989, now exactly 25 years ago. This very same year the Dutch artist Karel Appel‘s work Frog and Cat became the first permanently installed modern art object on the island. In the years after slowly but steadily the island was developed further with the opening of the Benesse House in 1992, the Art House Project in 1998, the Chichu Art Museum in 2004, the Lee Ufan Art Museum in 2010, by the placement of numerous art objects outdoors and by the extension of existing projects. By today Naoshima has grown into a unique island. You can easily spend a day or more enjoying the combination of the finest modern art, architecture and the beautiful surroundings of the Seto Inland Sea. 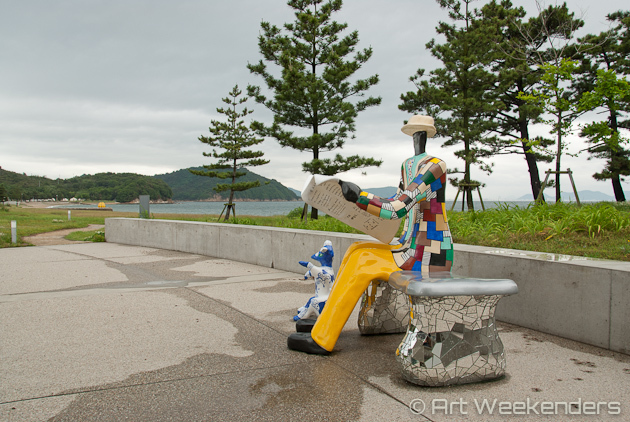 Le Banc, artist Niki de Saint Phalle – Naoshima, Japan. With the opening of the Benesse House in 1992 the first art activities on the island were started under the name Naoshima Contemporary Art Museum. The building and facilities around it were all designed by the acclaimed Japanese architect Tadao Ando. If you appreciate modern architecture, you will certainly like the result. The museum houses works by international artists like Andy Warhol, Jackson Pollock and Alberto Giacometti on a permanent basis and extends to the outside beach and park area. Here you will find numerous art objects of among others Niki de Saint-Phalle, Walter de Maria and Yayoi Kusama, some just in front of your eyes, others at more hidden locations. It is an art exploration you are here for after all. 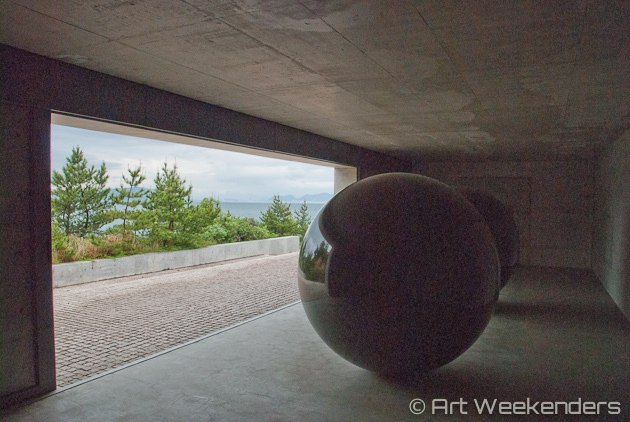 The ChiChu Art Museum was one of my personal favorites on the island. Walking through the largely underground building designed by Tadao Ando will either give you the feeling you are in a magical place or leave you with a big disappointment. The museum is in fact an artwork by itself, mixing art and architecture in a very balanced way, with spaces specifically designed to display the works of for example James Turrell, Walter De Maria and Claude Monet. All objects and rooms are lit by natural lighting, completely fitting in with the sophisticated and refined Japanese style you see more of in Japan. It is one of the few places I have been, where I felt the architecture of the building was actually created around the works at display instead of the other way around. On the other hand, if you are not into modern architecture and minimalism, you may not appreciate this museum as much. The art on display is more limited than what we normally are used to. Outside the museum you will also find a 400 m2 garden with plants and flowers that appeared in Monet’s works. You will not only find art in the museums of the island. Art has been taken into the residential areas as well. 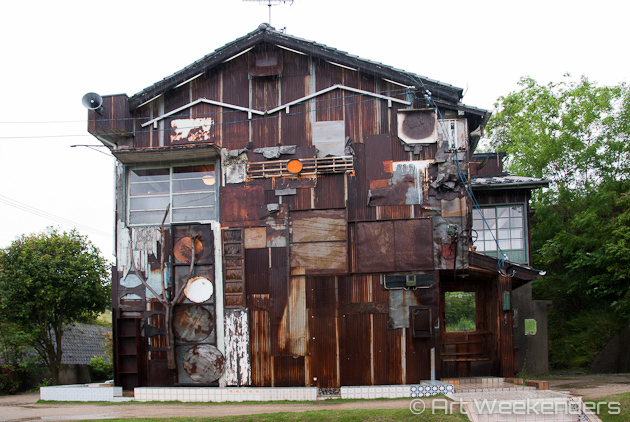 In the Honmura district seven abandoned houses -individually named Kadoya, Minamidera, Kinza, Go’o Shrine, Ishibashi, Gokaisho, and Haisha – have been converted into works of art with the purpose to create a certain interaction between the local community, Naoshima’s visitors and the art surrounding them. 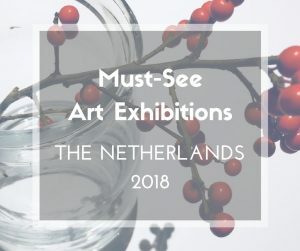 Where at some spots you will experience art in a natural environment, at other locations you will be wandering around in more urban settings, discovering part of the island’s culture. In the Lee Ufan Art Museum, also designed by Tadao Ando, you will find works by the international renown Korean artist Lee Ufan, created from 1970 until present. Also here art, architecture and nature form one unity, creating a place to meditate or at least stimulating you to have a moment of reflection. That is, if you are in the mood for it. If you are not, it may feel quite empty. On an island where most of its art venues are designed by Tadao Ando, a museum about the well-known Japanese architect is not more than logical. His museum is housed in a hundred year old traditional wooden house in Honmura style. Apart from photos, sketches and models of Tadao Ando’s work, the house summarizes the architect’s style by a mixture of different contrasting materials and elements and the play with natural light. Miyanoura Gallery 6 is a relative new exhibition space, designed by the architect Taira Nishizawa. 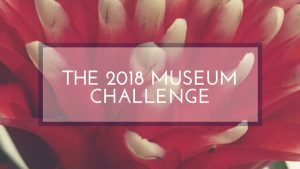 Different exhibitions take place throughout the year, so check out the exhibition agenda before heading there to make sure the gallery is open. After a long day of strolling along the art venues time is right for some relaxation in Naoshima’s Bathhouse. Both the interior and exterior are designed by the artist Shinro Ohtake, who has turned the bathhouse into a colourful and playful venue. If you really want to absorb the arts during your stay at Naoshima, this bath is a must visit. On the nearby islands of Teshima and Inujima a number of other art venues have been built with among others a continuation of the Art House Project on Inujima. The balance between art, architecture and the surrounding nature are key in all projects and if you liked Naoshima, than you will most likely enjoy these islands too. Every third year the Art Setouchi Triennale takes place at twelve islands in the Seto Inland Sea (including Naoshima) and the nearby cities of Uno and Takamatsu. The event lasts for a bit more than 100 days, but many related activities take place in the period in between too. The next triennale is in 2019. 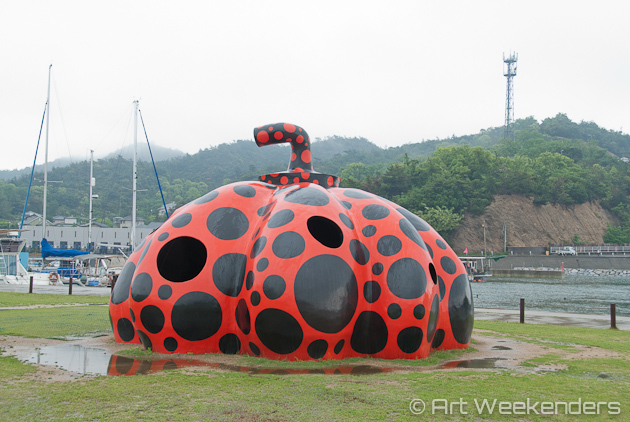 Pumpkin by Yayoi Kusama – Naoshima, Japan. Many cities and areas in Japan are within a short reach from each other thanks to the Shinkansen, the bullet-train which has a maximum operating speed of 320 kilometres per hour. To get to the art island of Naoshima in Japan take the JR Uno Line to Uno, about an hour from Okayama. You may need to change at Chaya-machi. From Uno take the ferry to Miyanoura, the main port of Naoshima. Alternatively you can also take a ferry from Takamatsu, but note that less ferries depart from here. For timetables of the trains check the Shinkansen website or simply use Google Maps, which generally also works fine in Japan. Check the Benesse House website for the time-table of the ferries departing from the different ports on the mainland. From Naoshima you can get a boat to Teshima, from there or from the city of Hoden on the mainland you can get a boat to Inujima. As soon as you arrive to the island, pick up a map from the tourist information desk in the Marine Station by the ferry port. Transportation around the island is by bike, minibus or foot. Rental bikes are available. If you decide to bike, we recommend to first cycle across the island to the Art House Project and the Tadao Ando Museum and continue your trip to the Benesse House area from there. In this way you can prevent too steep climbs uphill (although you will still encounter some!). Although it is possible to visit the island during a daytrip from the mainland, to really enjoy the island we recommend to visit the island for one and a half day minimum. More and more ryokans – Japanese style inns – and AirBnBs are popping up in the region. We found an excellent AirBnB, a lovely beach house with a view to the Inland Sea in Uno, close to the ferry terminal and the train station. One of the most exclusive places to overnight is the Benesse House, which is said to offer exclusive views of the building itself. Room-rates are pricey and can go up to well over € 500,- for the most exclusive spots. If it is worth it? Travellers opinions vary. Make sure to book your stay ahead online to ensure a place to stay, the options are still not plenty. We recommend avoiding Naoshima during the Golden Week, the busiest holidays period in the year.